Eddie Joe And Maurine Cozart Grandson! 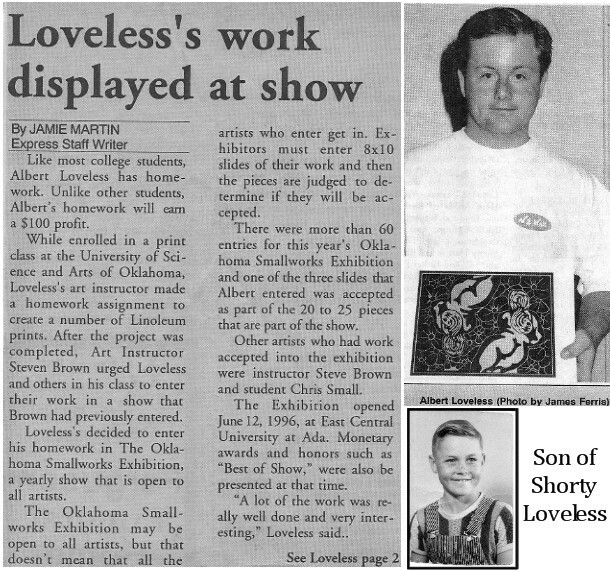 Debbie Stoll is the Wife of Lyndle Stoll. 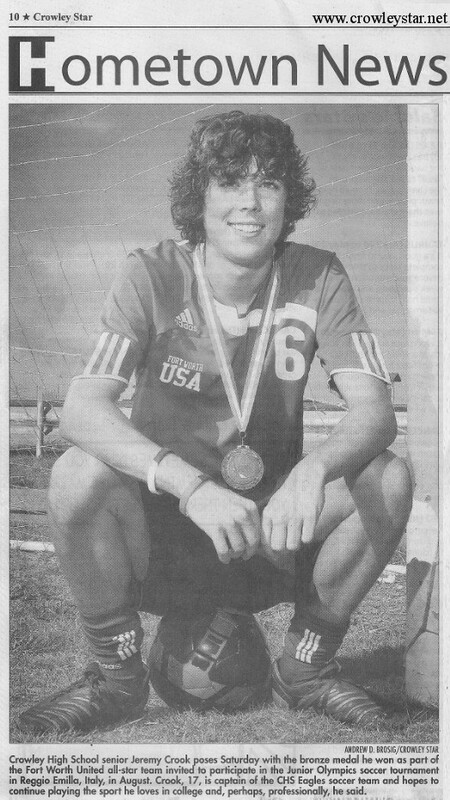 Lyndle Stoll is the Son of James and Linnie Mae Stoll all of which live on the Baseline. Cameron University Department of Education faculty members Debbie Stoll and Stephanie White are among the nine recipients who have been awarded Service-Learning Incentive Grants for the Fall 2009 semester by the Oklahoma Campus Compact (OkCC). Service-learning is a teaching method that combines community service with academic instruction as it focuses on critical, reflective thinking and civic responsibility. Service-Learning programs involve students in organized community service that addresses local needs, while developing their academic skills, sense of civic responsibility, and commitment to the community. "We applaud Debbie Stoll and Stephanie White as grant recipients for their service-learning projects," says Dr. Ronna Vanderslice, Dean of Education and Behavioral Sciences. "Enhancing student learning by incorporating service that meets a community need into their coursework is a critical part of our mission in providing quality education at Cameron University." Stoll will utilize her grant to supervise students in CU's Early Childhood Education program to collaborate with HeadStart programs in educating parents on the value of play. White will supervise Elementary Education students in selecting high quality children's literature and reading to children at a daycare or school. Each will communicate the results of their efforts at a state reflection meeting presented by OkCC. Established in 2000, Oklahoma Campus Compact is an organization of Oklahoma college and university presidents who have committed to articulating the importance of civic responsibility as an outcome of higher education. The organization provides leadership, networking and technical assistance to campuses and communities in service learning, civic engagement and community service. 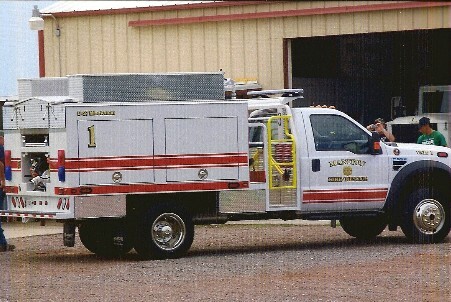 The Manitou Voluntary Fire Department received their new fire truck Friday 5/15/09. They received a grant for most of it but did have a Chili fundraiser and also the Manitou Methodist Church had an Enchillada fundraiser to help. 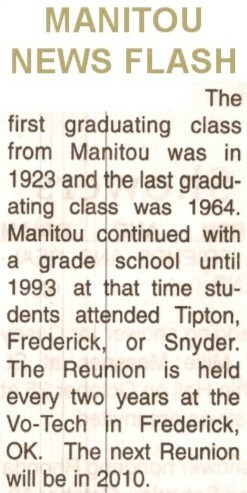 Also the Manitou School Alumni donated $1,000 in October after our last Reunion in 2008. Manitou has a group of volunteer fireman that take pride in being a fireman and they are very appreciated of this new truck. The U.S. Department of Homeland Security’s Federal Emergency Management Agency (FEMA) awarded a $118,750 Assistance to Firefighters Grant (AFG) to the Manitou Volunteer Fire Department. Nationally, the AFG awards, which will be distributed in phases, will ultimately provide approximately $560 million to fire departments and nonaffiliated emergency medical service organizations throughout the country. AFG awards aim to enhance response capabilities and to more effectively protect the health and safety of the public with respect to fire and other hazards. The grants enable local fire departments and emergency medical services organization to purchase or receive training, conduct first responder health and safety programs, and buy equipment and response vehicles. Since 2002, AFG has provided over $3.5 billion in grants to fire departments and first responder organizations to purchase response equipment, personal protective equipment, vehicles and fire prevention activities. AFG is administered cooperatively by two FEMA components: the Grants Program Directorate and the United States Fire Administration. The Annual Chamber Banquet was held Thursday night, naming the Most Useful Citizens of Frederick; Georgia Greenfield and J.M. Cope. The Chamber Volunteer of the year went to Sue Clifton, the Special Volunteers of the Year were Louis & Betty Box, and Dan & Twyla Elsener; Bobby & Georgia Jackson.. Lindsay Jo Harrington Ms. Oklahoma, U.S.A. was presented a special recognition award from Vinson Orr Two signs which will be displayed at the edge of Frederick in her name. The Keynote speaker was Ralph Manley, WWII Paratrooper Veteran. I have made a mistake and not too happy I have to apologize for it. Yesterday I was getting my mail at the post office and Jerry Stoll came in and he said he needed to talk to someone and maybe I was the one. 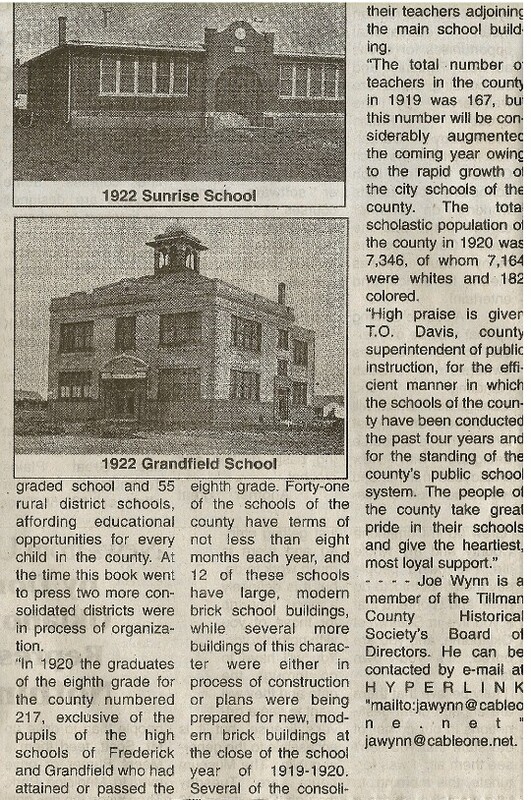 He said Manitou Grade School closed in 1993. I agrued with him thinking Ray died in 1991 and Kim graduated the 8th grade in 1991 and I thought the school closed. 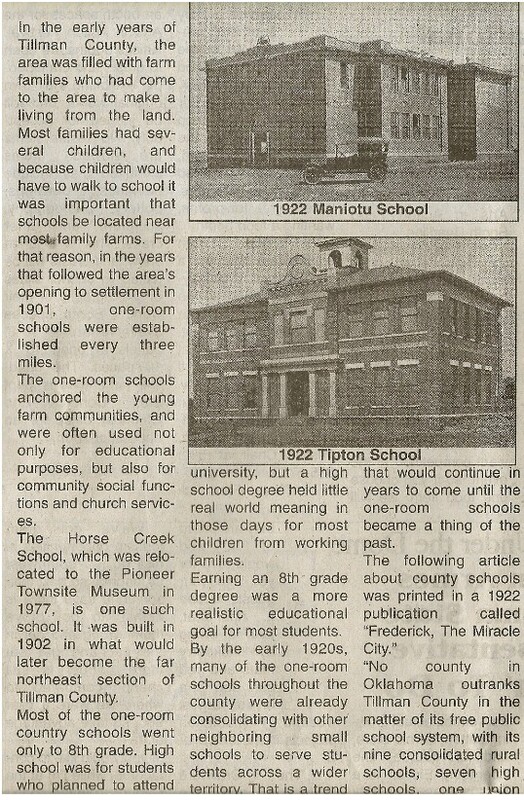 Then I came home and got to thinking about it and Dana was teaching school at Manitou and was pregnant with Kaley and she was born March 1993 so the school had to closed in 1993. Gas down to $1.52 a gallon here in Frederick. This is great news for us here in Frederick. Edward Trent Schrick, 20, a firefighter with the Manitou Volunteer Fire Department, was arrested Friday, November 21, 2008 on six charges of 3rd Degree Arson. According to Col. Mike Grimes, Director of Investigative Services, Oklahoma Department of Agriculture, Schrick allegedly set six fires in rural Tillman County near Manitou. Grimes said his agency, in conjunction with the Tillman County Sheriff’s Department, began the investigation that resulted in Schrick’s arrest back in February of this year. He said they have investigated “in excess of 50 fires” during that time. Grimes said the arson charges have been turned over to the Tillman County District Attorney for formal filing. Assistant District Attorney Deanna Hansell said she would file six counts of 3rd Degree Arson against Schrick in Tillman County District Court on Monday, November 24. Hansell said if convicted Schrick faces a maximum penalty of 15 years in prison and a $10,000.00 fine on each count. • Resign from Manitou Fire Department. • Travel to school with parents or relatives. • Be supervised at all times away from home. • No firearms in home or vehicle. 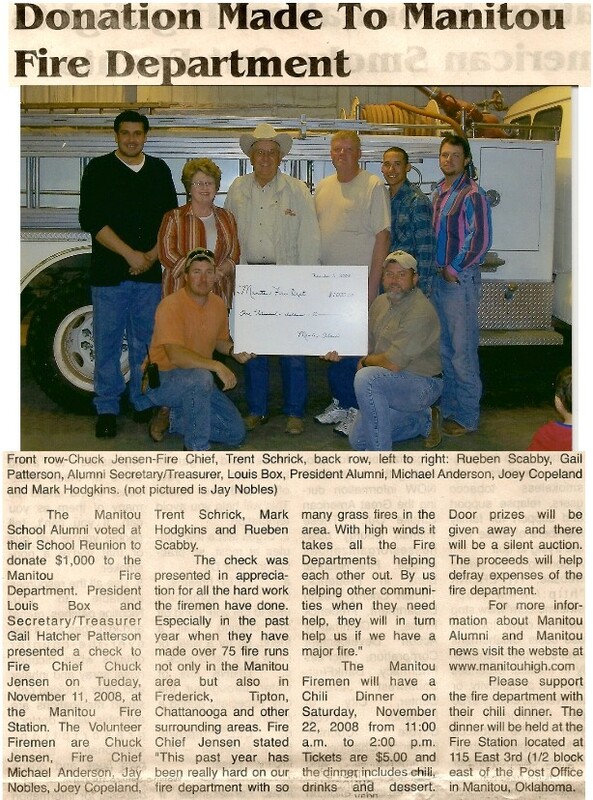 Just wanted to let you know we are meeting with the Manitou Fire Department to present them with a $1,000 check that we voted to donate at our Reunion in October. We will meet them at the Manitou Fire Station at 7:00 tuesdsay night November 11, 2008. It will be short & sweet and hope maybe to have at least one newspaper there. I have been in contact with Chuck Jensen and he thinks all of the firemen will be there that night (unless there is a fire and we may be inducted into the fire dept.) ha. The Manitou Fire Department will be having a Chili Dinner November 22 from 11 to 2 (I think) and they will be charging $5.00 per ticket and have drawings & silent auction. I am sure you will hear more about it closer to time. I suggested to Chuck to present them with this check that day and he said he felt like they might be too busy so this is when he wanted to do it. Hope you can come if you can.